With CBSE examination just a few weeks away, you got to study smart while fully utilizing whatever time left for the examination. Therefore, it is utmost essential to get familiarized with what is going to be on your Maths question paper. You need to strategize and organize yourself to excel within those 3 hours duration of the examination. To speed-up your revision, doubtnut.com has prepared the Important Questions of CBSE Class 10 Maths for you TO STUDY SMART AND NOT HARD. 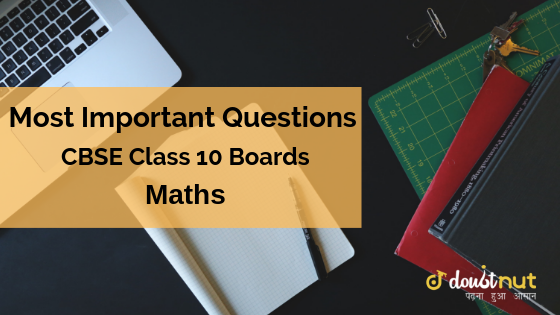 Given here are all Important Questions for Class 10 Maths with Solutions as per the latest syllabus and NCERT guidelines. Practising these CBSE Class 10 Important Questions will help you in the chapter-wise revision of your complete syllabus. These are classified in the list form for your convenience. How to practice CBSE maths important questions in class 10? Understand the question: Firstly, you must read the question carefully. Then properly write all the information given. What’s required to prove: Now simply state those things that you need to prove in the question paper. It can be the formulas or theorems that will help you meet the end answer. Finally the proof: Now that you fully understand the given question and know the formulas prerequisite to solve it, start solving the question in step by step manner. Always remember this simple trick while solving any Math question. With this, you are sure to fetch some extra marks. Why Solve Maths Important Questions Class 10? The experts at doubtnut.com have collected questions from previous 10 years question papers. Practising these most Important Questions will help in quick revision of entire syllabus in minimum time. The study materials are given herein with solutions that can act as a chapter-wise test for class 10th Maths. Learn the right identification and application for the class 10 Math formulae. Your key to score an A1 in the mathexam. Best way to be completely in sync with your NCERT book. Get the idea of question formation and final exam pattern. Best for last-minute quick revision of entire syllabus. It is your key to learn management time. The CBSE board exams are keeping in mind every kind of student i.e. below average, average, above-average and intelligent students. Hence, the approx. 70% of the question paper will be going to be a quiet average and only 30% will be a bit hard. Therefore, solving these Important Questions for Class 10 Maths with Solutions you can gain a competitive edge to ace the examination with flying colours prepared. Doubtnut.com is India’s leading e-learning website, offering Important Questions of CBSE Class 10 Maths for every CBSE students all across India. Get here Important Questions for Class 10 Maths with Solutions as per the CCE marketing schemes provided by the CBSE. While solving the given question in case you face any difficulty in understanding of the concept or you cannot structure the answer, you can anytime refer to our NCERT Solutions videos for Maths as well. ALL THE BEST FOR BOARD EXAMS!